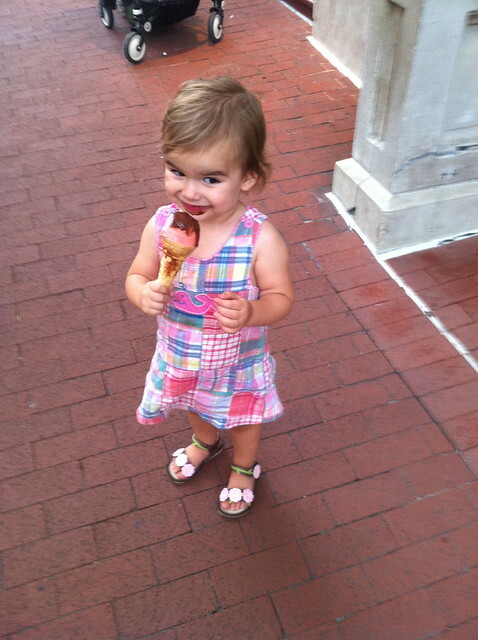 Lucy had her first ice cream cone tonight at Pitango. Believe it or not, that’s a chocolate sorbet on top. (Strawberry sorbet on bottom.) Good thing Dad doesn’t like chocolate; she doesn’t seem to like sharing it. She says “ice cream shop” so well thanks to one of her favorite books: Curious George goes to an Ice Cream Shop. She also talks about pizza dough a lot because of Curious George’s trip to a pizza party. Chefs and restaurant owners, here’s some advice: if Curious George shows up at your kitchen or dining establishment, he’s probably going to make a mess, but remember that he means well.